Everyone knows Florida is the mecca for boats and yachts. It doesn't matter if it's a Sportfish or a Motor Yacht, if it floats and is over 40-feet, chances are you'll find it in Florida waters at some point during the year. The combination of spectacular year-round weather, tropical waters, an abundance of game fish, and seemingly endless sandbars are enough to make anyone move to the sunshine state and buy a boat. Brands like Sea Ray, Hatteras, or Boston Whaler are among the most commonly seen on the ICW, but there are also some lesser known boats cruising around. With so many yachts for sale in Florida, we have compiled a list of the most interesting, unusual, or mind-blowing boats on the market today. While not every one of these yachts is listed with United, our team has the industry and market expertise to help you find the perfect boat or sell your existing one quickly. This 161' Trinity Yachts MY has one of the most amazing flybridge areas we have seen. Imagine you and your closest friends cruising the waters off of Key Largo or venturing over to Bimini while relaxing in the jacuzzi, running on a lounge chair, or enjoying a freshly made frozen cocktail at the bar. This Trinity 161' has all of the amenities and features you could ask for on a luxury yacht. The Trinity shipyards always made fantastic motor yachts and "Zoom Zoom Zoom" was certainly no exception. The amount of areas to relax, catch some sun, or just enjoy the view seem endless on this yacht. If diving to untouched coral reefs in the comfort of a luxurious yacht sounds appealing, "ATOMIC" may be the yacht for you. This 147' Sunrise Motor Yacht is described as a "comfortable dive explorer yacht" as it features five large staterooms that can comfortably sleep up to 11 guests. The interesting concept on ATOMIC is the "Beach Club" concept as the epicenter of the adventurous activities of the owner. The Beach Club includes a professional Nitrox Dive Center complete Nuvair LP 280 Nitrox generator, Nuvair MCH air compressor, a four-way quick connect manifold, and plenty of storage for all the masks, fins, and equipment you need. The Beach Club even has workout equipment to keep you in diving shape while the boat is underway. What would a trip to Florida be without one of the sunset dinner cruises around the local waterways? Now you can own your own dinner boat. Back in 2018, United reported on how the new changes to the tax law would make buying a boat used for business purposes more affordable. Owning your own dinner boat for cruising, parties, and events could certainly become lucrative, but now you can also deduct 100% of the cost and improvements to it! "Sir Winston" as its named is certified to carry up to 374 passengers. This is certainly not your average boat for sale in Florida waters. Imagine your boat being used to evacuate troops during a major world war! "Grey Mist" has that history and certainly had the accommodations to do it. In the Summer of 1940, many civilian boats and yachts were used to evacuate the British Expeditionary Forces and other Allied troops from the French seaport of Dunkirk. With German forces invading the lower countries, as many people were evacuated to England as possible. "Grey Mist", a 1920 127' Classic has this incredible history as being one of the civilian boats involved with the evacuation. Now with a recent re-fit, she is available for sale in Fort Lauderdale and can comfortably sleep 14 adults and has brand new engines. You know your yacht might be a little too big when you have to have an elevator that runs to all 3 floors. "Miss Gloria" made our list for that reason. This 96-foot Hargrave yacht has 3 decks and features a 2-person elevator that services all levels. The gorgeous wood interior really presents an elegant feel on this boat, most of which was completely replaced in 2013. 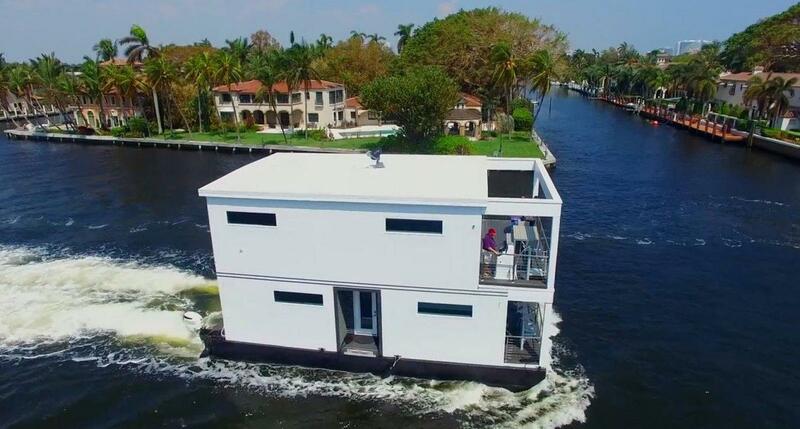 "Miss Gloria" is currently for sale in Dania Beach, Florida for under $3.5 million and also includes a 1,400 gallon-per-day water-maker. 100% solar powered yacht? The "green" future is now with this 2016 Silent Yachts Solar Wave 64. If concern for the environment has been keeping you from buying a yacht, your last excuse has been put to bed. The Silent Yachts 64 is fully solar sustainable and powered by solar energy. Solar panels on the hardtop collect the energy and store them in the highest quality lithium batteries available. This boat can literally cruise for 100 miles per day, endlessly. Even the generators are run on solar power providing for an absolutely silent cruising experience. The space provided from the wide-beam of the catamaran also provides some spectacular living areas. Most people enjoy living on the water, but if you truly want to go all-in then Luxuria might be the live-aboard yacht for you. Likely one of the most interesting boats on the water today, Luxuria truly offers a different sense of waterfront living. She includes ultra-high end construction that actually surpasses most homes and condos on land. She is extremely well-insulated with high-efficiency climate control, built to Florida hurricane codes, and features high-end furnishings throughout. And best of all, Luxuria can actually bring in $1,100 per night in rental without any marketing! With over 150 yacht brokers worldwide, United Yacht Sales has the largest network of buyers and sellers in the world. Combined with our strategic marketing efforts and industry leading website, we have the capability to sell any kind of boat or yacht regardless of how interesting, unique, strange, or difficult it may be to sell. Learn about all the reasons why you should list your yacht with United and then give us a call at (772) 463-3131 to get started with one of our professional brokers.